I am personally not a lamb fan. (I know, hush up- I’ve tried really hard to like it, honest. 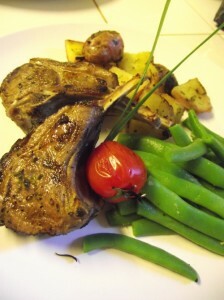 Still just not my thing…) My husband however loves it so every now and then I will throw some lamb chops on the grill. If you have a good butcher he will French them for you. (To trim the bone end clean and basically make them a bit “lollipop” shaped.) Rosemary is the perfect flavor pairing with lamb and these grilled chops are a classic. You could also drizzle this Red Currant Sauce over your lamb chops for a fantastic flavor pairing. Season lamb chops liberally on both sides with fresh black pepper and ground sea salt. Mix all ingredients in a small bowl until well blended. Coat both sides of chops and set in fridge to marinate until ready to grill (2-3 hours is ideal). Place coated chops on hot grill. Depending on size they will only need about 3 minutes per side on medium heat, flipping only once.